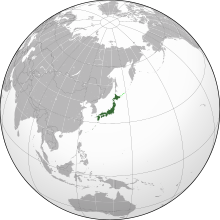 ↑ "World Factbook: Japan". CIA. Retrieved 15 January 2011. ↑ "Japan Statistical Yearbook 2010" (PDF). Statistics Bureau. p. 17. Retrieved 15 January 2011. ↑ "Japanese population decreases for third year in a row". Retrieved 9 August 2012. ↑ "Population Count based on the 2010 Census Released" (PDF). Statistics Bureau of Japan. Retrieved 26 October 2011. ↑ 7.0 7.1 7.2 7.3 "Japan". International Monetary Fund. Retrieved 19 April 2012. ↑ "World Factbook: Gini Index". CIA. Retrieved 11 May 2011. ↑ "Human Development Report 2013" (PDF). UN. 2013. Retrieved 14 March 2013.